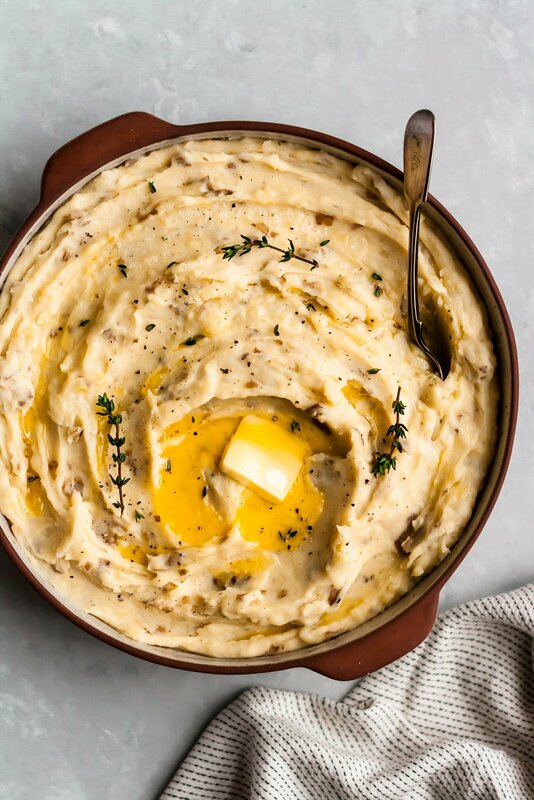 The BEST creamy slow cooker mashed potatoes infused with garlic. 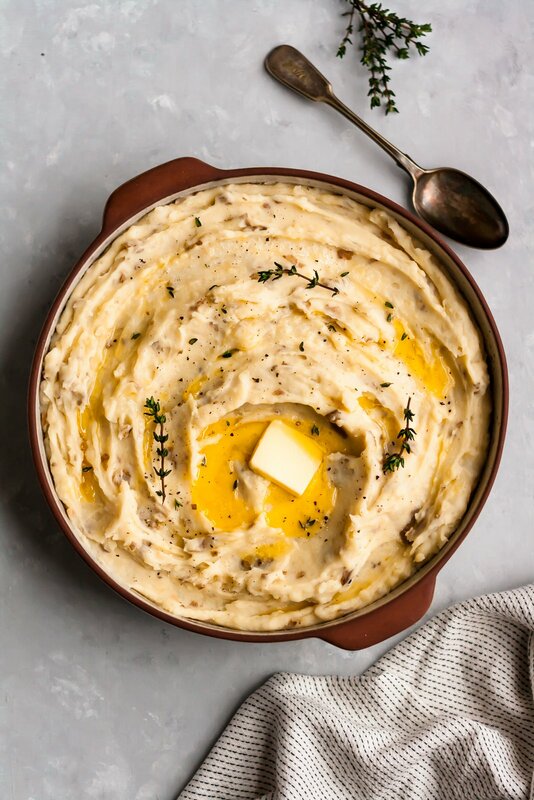 This healthy, lightened up version will be your family’s new favorite mashed potato recipe! Fact: cooking time is very limited on Thanksgiving. You’ve got to somehow fit a turkey in your oven, make mashed potatoes and gravy, serve a pie and put the other amazing sides on the table. How will you do it?! Don’t worry, I’ve got a solution: amazing creamy garlic mashed potatoes made in your slow cooker! It’s a game changer and frankly, I was shocked when they came out exactly the way I wanted them to: creamy, smooth, delicious and full of flavor. This recipe was inspired by my mother in law, who is known for making the most creamy delicious mashed potatoes during Thanksgiving (Hi Judy!). She always does something a little different, but my most favorite is when she adds just a little butter and sour cream and then mashes them to perfection. I tried my best to replicate the recipe on the blog, but still keep it lightened up, because I believe they’re well worth trying. In order to simply the process and save a little time on thanksgiving day I decided to take her recipe and make it in the slow cooker for ease. It was magnificent and can guarantee creamy mashed potatoes in just a few easy steps. Let’s get to it! Step 1: Place diced potatoes and peeled garlic cloves in the slow cooker with a little broth. The broth prevents the potatoes from sticking to the bowl of the slow cooker and allows them to steam a little while they cook. 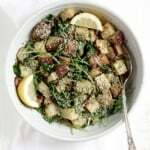 Personally, I like using Yukon gold potatoes because they’re softer and more buttery in flavor. I also like to keep the skin on the potatoes, since I think it adds a nice texture, but feel free to peel them if you want an even smoother version. Step 2: After potatoes have been cooking in the slow cooker and are very fork tender (4 hours on high was perfect for me! ), add in sour cream, butter, a little milk to start and salt and pepper. Then mash with a potato masher. I don’t recommend using an electric mixer because there are a lot of potatoes and my fear would be them going everywhere. Step 3: Everyone likes their potatoes a little different, so you can really adjust here as you see fit. Add additional milk to make the potatoes creamier or feel free to add in more butter and use whole milk for richer, ultra creamy mashed potatoes. Tip: Be sure to generously season your mashed potatoes with salt and pepper and then mix again and taste a bite or two before serving — it’s important to taste as you go, adding more of this and that where needed. Experiencing is what cooking is all about, learning to trust yourself and adjusting flavors! Step 4: Have fun. This recipe is easy and pretty impossible to mess up. Don’t stress too much about it. When all done and your potatoes are creamy and taste delicious, simply scoop into a warm bowl right before serving, then garnish with a pat of butter and freshly ground black pepper on top. YUM. I hope you love these creamy slow cooker mashed potatoes. 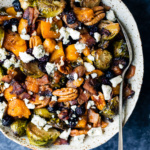 They’re easy, so GOOD and a wonderful way to save both time and space during Thanksgiving. 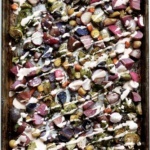 Let me know if you make this recipe by rating the recipe and leaving a comment below — xo! 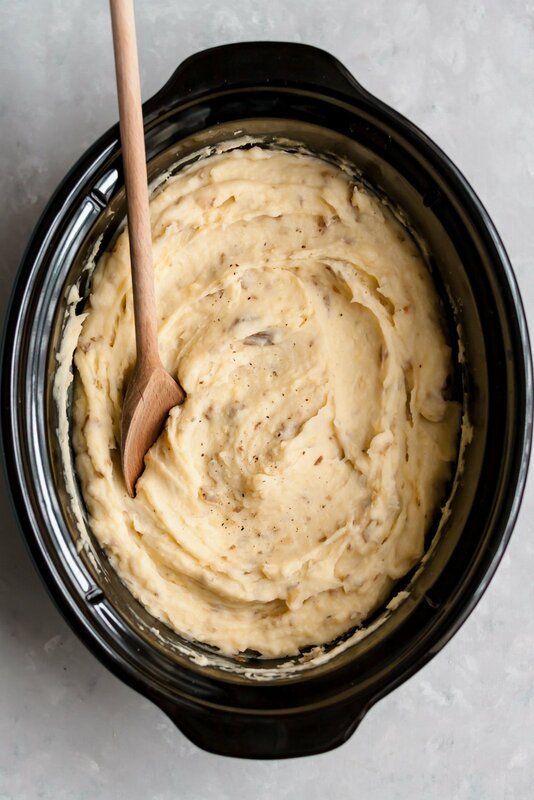 The BEST creamy slow cooker mashed potatoes infused with garlic. 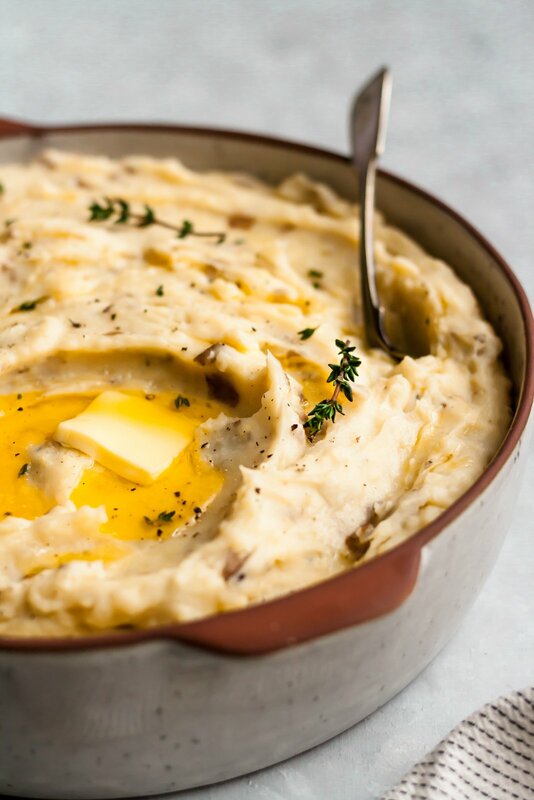 This healthy, lightened up version will be your family's new favorite mashed potato recipe! 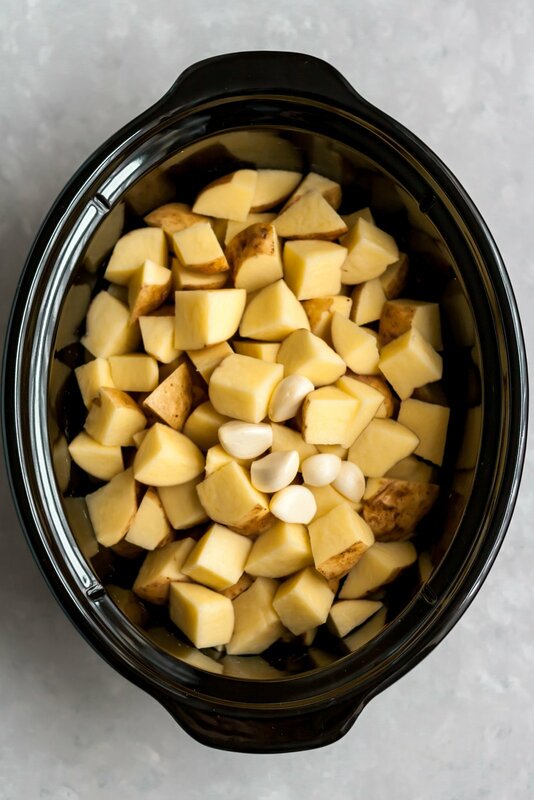 In a large 5 or 6 quart slow cooker add diced potatoes, garlic cloves and broth. Cook on high for 3-4 hours until potatoes are very fork tender. Once potatoes are done cooking, place slow cooker on warm setting and add in butter, sour cream and 2 cups of milk to start. Use a potato masher to mash potatoes until they reach your desired consistency. I happen to like my potatoes super creamy, so I mash them until they’re completely smooth. If you want your potatoes creamier, add in ½ cup-1 cup more milk. Finally, a generous amount of salt and pepper, then mix again. Taste, and add more salt and pepper if necessary. 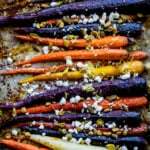 Transfer to a large warm casserole dish for serving, add a pat of butter, a sprinkle of fresh thyme, and a little freshly ground black pepper. If you want a richer, very silky smooth version, you can use a ½ cup of butter and whole milk. If you don't like potato skins, feel free to peel your potatoes before placing them in the slow cooker. If you're keeping the potatoes warm in your slow cooker you may need to add more milk to keep their silky smooth texture. 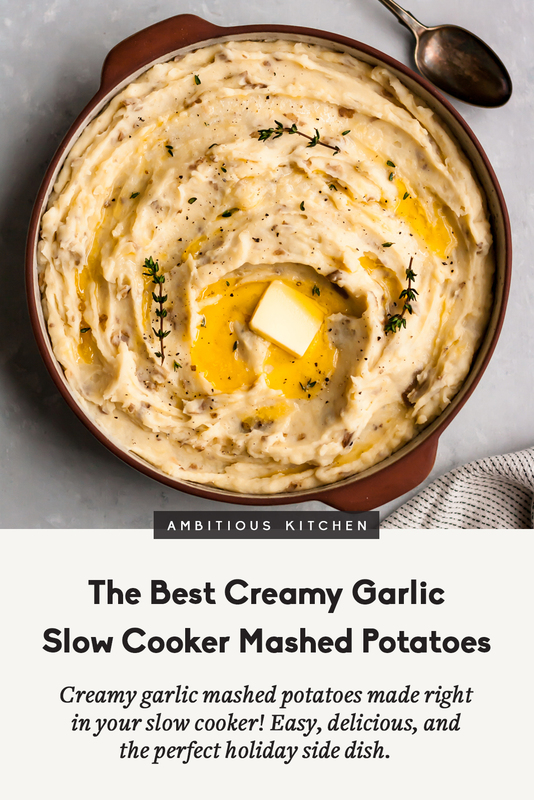 23 Responses to "The Best Creamy Garlic Slow Cooker Mashed Potatoes"
This is really fascinating to me. I’ve never thought of using a slow cooker for mashed potatoes! I also prefer skins on. It’s so easy! I like skins on, too. When I have a large crowd to feed, I use my slow cooker as a way to keep the mashed potatoes ( great for stuffing too) warm until serving. This year I am trying your method to cook the potatoes in the slow cooker. Looking forward to not having another pot to clean! Perfect! Such a time (and countertop space) saver. Enjoy! Would it compromise flavor to sub greek yogurt for the sour cream? Just not a big fan of sour cream but still want them to be creamy and a healthy substitute would be ideal. Sour cream really is the star here as it gives the potatoes a delicious creaminess, though I’m sure greek yogurt would work. I would advise using whole milk or 2% greek yogurt. 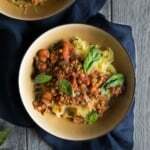 Do you think this recipe would work with bone broth? This is my new favorite mashed potato recipe!!! Is there anything else I could use besides sour cream or Greek yogurt? Don’t really like either. Thanks! Just use a tad bit more milk! This was really good. Only used 1 cup of milk and they were super creamy. I wasn’t sure what to do with the garlic since it doesn’t really mash up. Perfect! Hmmm the garlic should soften with the potatoes so that you can mash it – you might just have to mash those parts up a little more. Oh my gosh, these mashed potatoes were a huge hit for our Thanksgiving feast tonight! Super simple, creamy and garlicky. Used only one cup of milk and they were perfect…and I don’t eat potatoes. Will make these again. 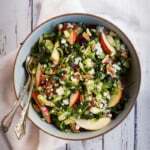 Can this recipe be made ahead of time? If so how should it be reheated? 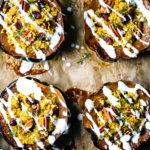 You can warm them in your slow cooker or in the microwave! You might just need to add more liquid to keep them silky smooth.